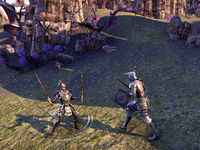 Combat in Elder Scrolls Online is dynamic. The game offers players a variety of visual and auditory cues about which actions may be appropriate next, including marking the area of impending enemy attacks in red, or by prompting the user to block or interrupt. All players have a variety of abilities that they can use in combat, which do not require any skills to be learned or slotted. Some of these have associated passive skills which reduce their cost or improve their effectiveness. This is a quick attack that can be performed with any weapon. If an opponent is targeted and in range, it will damage the opponent. It is performed by tapping the attack button. Light attacks require no Stamina or Magicka. The damage of light attacks scales based on your Maximum Stamina and Weapon Damage, or Maximum Magicka and Spell Damage for staves. This is an attack which must be charged. It does more damage per attack than light attacks, though less damage per second due to the charging time. There may also be further effects. Using a heavy attack against an Off Balance opponent will knock them down. Heavy attacks are performed by holding the attack button. Heavy attacks require no Stamina or Magicka. The damage of heavy attacks scales to your Maximum Stamina and Weapon Damage, or Maximum Magicka and Spell Damage for staves. Heavy attacks restore Magicka (with staves) or Stamina (other weapons) when fully charged. The amount restored scales to the length of time that the heavy attack takes to charge, so for example, a heavy attack with a 2-handed weapon will restore more Stamina than when dual wielding. The amount restored also scales to player level. Restoration staves and Lightning staves will begin channeling damage as soon as the heavy attack begins. This can be a detriment if you don't want to catch the attention of an enemy until the attack is fully charged. Heavy attacks with a Frost Staff will additionally Taunt an enemy if you have points in the Tri Focus skill. A Tank charging a Power Bash. Note the yellow lines that indicate this attack should be blocked. Blocking can be performed with any weapon, or with a 1-handed weapon and shield. For most attacks, a successful block will reduce damage taken by half, and prevent any negative disabling effects associated with that attack. The Stamina cost of blocking depends on the player's level. Blocking an enemy's heavy attacks will set it off balance. 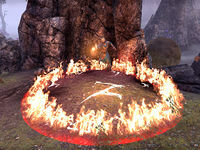 Damage from ground target AOEs like Wall of Elements and effects that are on or inside characters such as Daedric Curse cannot be blocked. Secondary effects associated with attacks (such as the Major Fracture from Surprise Attack) cannot be blocked, even if the main damage from the attack can. A Fire Mage and his Fire Rune. Note the red circle that indicates this area should be avoided. Area of Effect attacks are often indicated as red areas. Roll dodging allows the player to roll in a given direction in order to escape an area of effect or break free of a rooting effect. The Stamina cost of dodging depends on the player's level. When rolling, all incoming attacks will automatically miss. Roll dodging also disables collision with all NPCs, so you can roll right through any enemy. This is useful for escaping if you're surrounded, but can also be used outside of combat to get past NPCs who are in your way. Performing a roll dodge will give the player dodge roll fatigue, increasing the cost of consecutive rolls until the effect dissipates. 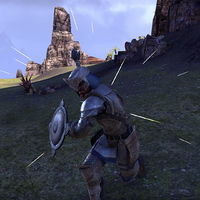 Damage from ground target AOEs like Wall of Elements or Caltrops and effects that are on or inside characters such as Daedric Curse cannot be dodged. Damage from magical AOEs such as Drain Power and beams such as Soul Assault or the heavy attacks from restoration or lightning staves cannot be dodged. A Fire Mage charging Heat Wave. Note the red lines that indicate this attack should be interrupted. Players can interrupt an opponent who is winding up an attack, as long as they are within melee range. Successfully interrupting an opponent throws them off balance. The Stamina cost of interrupting depends on the player's level. Some active abilities, such as Venom Arrow, can also interrupt. There is no additional Stamina cost beyond the normal cost of using the ability. A character performing Break Free. Note the swirls at the character's feet that indicate immunity to CC. Players can break free of some forms of crowd controlling effects, such as stuns. The Stamina cost of breaking free depends on the player's level. After breaking free, the player is immune to crowd control effects for 7 seconds afterwards. Stealth enables you to sneak without drawing an enemy's attention, and greatly reduces the distance you can be seen by enemy players in Cyrodiil. Physical attacks inflicted while you are sneaking and undetected will automatically crit, and you will subsequently stop sneaking. When you are in sneak mode, your Stamina will drain while moving, and recharge when you stand still. Moving in stealth also comes with a significant speed penalty, which can be avoided by using certain sets, or with the vampirism passive Dark Stalker. Players can slot 5 active or toggled abilities, in addition to a single ultimate ability. These are the main skills that a player uses in combat, and are known as the combat bar. Once a player reaches level 15, they can switch between two combat bars. This requires having two different sets of weapons (or weapons and shields). You cannot use the same weapon for both bars, but you can use a second identical weapon for the second bar, if you wish. The damage and effect of abilities are calculated regarding the bar that was active when the ability is used, even if the effect or damage carry on after bar switching. Active abilities usually have an attribute resource cost associated with them. Most class abilities require magicka. Some can later be morphed to use stamina. Most weapon abilities require stamina. The exception is staff abilities (both destruction and restoration), which require magicka. 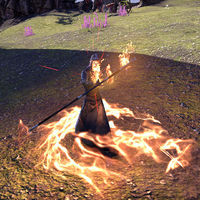 Abilities from other skill lines, such as those from factions or armor, usually also require stamina or magicka. Some active abilities require a hostile target before they can be used. Other abilities may automatically pick a target. 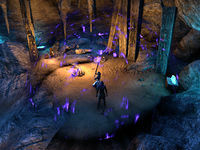 Abilities with an area of effect may require the player to target an area on the ground after clicking the key for the ability, while others are simply centered around the player and require no aiming. Some abilities are toggled, which means they remain active until the user disables them. 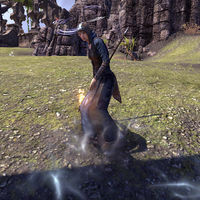 These abilities may have a one-time cost associated with them, in addition to a constant negative effect, such as doing less damage or lowering your maximum magicka. Switching to an alternate combat bar that does not include the toggled skill in the same slot will automatically disable it. Only one ultimate ability may be slotted at one time. Ultimate abilities charge over time by accumulating points of Ultimate. Damaging an enemy with a light or heavy attack will grant 3 Ultimate per second for 9 seconds. Other effects may also grant additional Ultimate, such as the Major or Minor Heroism effect as well as the Banish the Wicked or Combat Frenzy passives. The weapon trait Decisive provides you with a percentage-based chance (up to a maximum of 40%) to gain 1 additional point of Ultimate any time you gain Ultimate normally. Once the ability is fully charged, it may be used. Using an ultimate ability completely drains your ultimate points to zero, regardless of whether you had extra ultimate charged. Healing a player who is gaining Ultimate will also grant you Ultimate at the same rate. You can store up to 500 Ultimate points. While all slotted abilities will fall into one of the above categories, some abilities will also provide a bonus to players simply by being slotted. Some examples are Restoring Aura or Flawless Dawnbreaker. Some skills have synergies, which allow allies to perform a variety of beneficial actions once a skill is used. Allies will see a message informing them that they are able to activate the synergy, which has no cost to the player who activates it. Synergies themselves cannot be slotted. Some examples of skills with synergies are Lightning Splash (with the Conduit synergy) or Nova (with the Supernova synergy). Each synergy has a cooldown preventing the same player from activating it continuously. Other synergies such as the "Brace for Impact" buff (while fighting Lord Warden Dusk in the Imperial City Prison) or the "Use Free Ally" synergy (when fighting Ruzozuzalpamaz in the Crypt of Hearts) are not related to player skills, but are needed to overcome the mechanics of the boss fight itself. These tend not to have cooldowns and can be activated by anyone. Players and opponents can be put into a variety of vulnerable states. These states can prevent or hinder movement or the ability to attack. Some abilities, such as Hawk Eye, affect opponents in any vulnerable state, while others, such as Ruffian, affect opponents affected by a subset of effects. A disabling effect is one that prevents a character or opponent from attacking. Players can break out of this state by using Break Free. A stunned character will be slumped over while kneeling. An example of a skill that stuns is Crystal Blast. A Fire Mage that was set off-balance. Note the white swirls. An off-balance character will stand dizzily for a short time. Opponents whose heavy attacks are blocked will become off-balance, as will some opponents after charging (such as Kagouti). Using a heavy attack on an off-balance opponent will knock them down. An example of an ability that can set opponents off-balance is Lava Whip. A character who is feared runs away in a random direction. Fear is cast by some unique monsters as well as some player abilities, including Aspect of Terror and the Werewolf Transformation ultimate. Silenced characters are unable to use Ultimate Abilities or use magicka-based abilities, but are still able to move freely and use other attacks. Silence is fairly rare in the game but can be caused by Negate Magic. Some effects are less severe than full disabling effects, and still allow characters to attack in some form. Breaking free does not remove these effects. Rooted or Immobilized characters cannot walk or run, but they are still able to attack, block and cast spells. An ability that roots is Dark Talons. Players can escape a rooting effect by dodge rolling. Bolt Escape allows a player to move, but the rooting effect will still be active on them. Similarly, NPC shock mages will be able to teleport while rooted. Snare effects reduce a character's movement speed, but do not otherwise hinder the character's ability to use attacks or other abilities. Snaring appears as a gray cloud at the character's feet. This very common effect can be triggered by any cold damage or by abilities such as Hidden Blade. The only way to remove a snare is to dispel the effect with an ability such as Purge or Retreating Maneuver. Upon damaging with certain types of damage there is a chance to cause certain debilitating effects to an enemy which either deal damage over time or apply a debuff to an enemy. These effects are called status effects. Damage-over-time abilities have a chance to apply status effect on every tick of damage. The base chance of applying status effect can be multiplied by either Charged weapon trait or Elemental Force passive from the Destruction staff skill tree. The Burning status can be applied by dealing Fire Damage to a character. When you apply burning status effect on an enemy, they take fire damage over time based on your Max Magicka and Spell damage. Burning effect lasts 4 seconds and ticks every 2 seconds. The Chilled status can be applied by dealing Frost Damage to a character. Chilled enemy suffers from Minor Maim debuff for 4 seconds, reducing their damage by 15%. The Concussed status can be applied by dealing Shock Damage to a character. Concussed enemy suffers from Minor Vulnerability debuff for 4 seconds, increasing their damage taken by 8%. The Poisoned status can be applied by dealing Poison Damage to a character. When you apply poisoned status effect on an enemy, they take poison damage over time based on your Max Stamina and Weapon damage. Poisoned effect lasts 6 seconds and ticks every 2 seconds. The Diseased status can be applied by dealing Disease Damage to a character. A diseased enemy suffers from Major Defile debuff for 4 seconds, decreasing their healing received by 30%. Although disadvantageous, it is possible to fight without a weapon equipped. Unarmed damage scales with your level, but you won't have the base damage stats gained by equipping a weapon. A shield can be equipped by itself, although it cannot be used while unarmed. Many non-hostile NPCs will use unarmed combat if they see you commit a crime. When you die, you are put into a blue-tinted third-person deathcam which can be rotated to look around. You can view a "Death Recap," which displays the last five attacks dealt to you, and three hints relating to the cause of death. Additionally, all equipped items lose durability each time you die to PvE, but item's efficiency won't decrease until you hit 0 durability at which point the item won't provide any benefit. Death to the players in PvP will not decrease equipped items durability. Durability can be restored by using a repair kit, purchasable from merchants. Most vendors also offer repair services directly, which are usually cheaper and quicker. After dying in PvE, you can resurrect yourself on the spot at the cost of a filled Soul Gem or choose to respawn at the nearest wayshrine. Group Dungeon/Trial boss fights will prevent respawning until every member of your group is dead (including any quest-related NPC companions in some cases). If you die in PvP, you may respawn at any Alliance-controlled keep that is not under attack and has at least one Alliance-controlled resource, or at a forward camp if you are within its radius. Allies may resurrect you on the spot as well, which can prove invaluable in situations where respawning is not an option. However, you cannot remain on the deathcam screen indefinitely and will eventually be forced to respawn at a wayshrine. With Combat Text enabled, floating text will display incoming and outgoing damage and crowd control. Each category of combat text can be found in the setting menu, under the Interface category. This page was last modified on 23 December 2018, at 09:06.